I ended up with this pen as I just took a notion a few weeks ago to order some new cheap pens. As this is a cheap pen you can guess what materials it is mainly made from. It is a standard looking plastic pen. The design does remind me of my AJOTO pen as it looks like a stretched tear drop. By that I mean from the top of the pen it goes from thin towards the bottom getting wider. 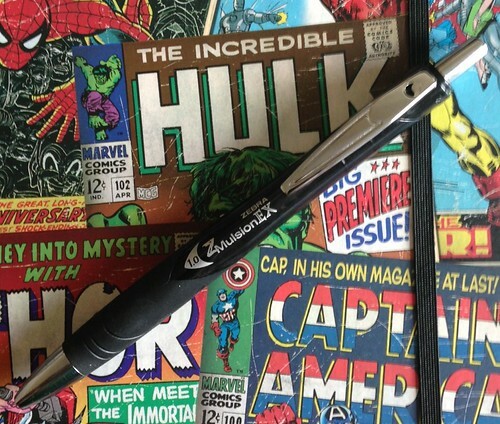 This does make the Z-Mulsion a comfortable pen to hold for long periods of writing. The area where you hold the pen uses a very effective rubberized surface. One surprise in the design is that when you hold it up to the light, the middle section is actually a see through plastic. This is a really nice touch. A painted plastic silver tip, clip and clicker complete the look of this pen. Depending on what colour you pick, the plastic that is used to hold the clip into place that is under the clicker matches you ink colour. These are small details that try to make this pen stand out from the crowd. For me it does achieve this. This is a very light pen that does feel a tad bit heavy towards to the nib section. This has to be expected though as the pen is wider at this end and has the rubber grip section. Both these features will increase the weight. Comparing it to other cheaper pens I own, it pretty much matches up in the length and wider department. 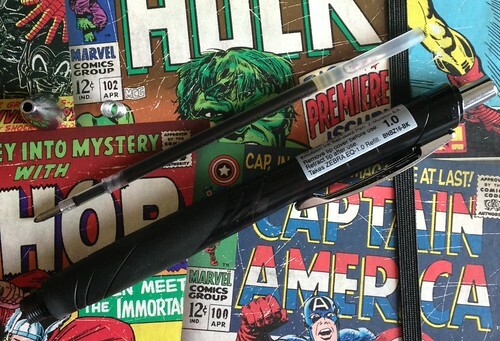 With nib retracted it comes in at 14.2cm in length. With nib produced it is 14cm in length. The cartridge that comes with the Z-Mulsion is called a “Zebra EQ Ballpoint” and you can get it in the following colours: Black, Blue, Red, Green, Violet Pink and Light Blue. You can also buy refills for the Z-Mulsion which cost £0.94. This refill uses Zebra’s 4th Generation Emulsion Ink. This means it is a oil and water emulsion which makes the ink dense, rich in colour and anti fade. It also has water-resistant properties which I haven’t put to the test! If you have I would love to hear what you think. You can only get this in a 1.0mm nib size. I am not really a big fan of this line width but it is a very smooth writing experience. Another good point is that it does dry pretty quick. The pen costed me £1.94 and I think for everyday use this is a pretty good pen. As I have pointed out above, I do find the line width to be to wide for my taste. Don’t let this put you off though.